Think of summer-time - strawberries and cream - not strawberry flavouring - but REAL strawberries. This cake mix makes one big delicious round cake or the most scrumptious little strawberry muffins - so good for a summer picnic or even for breakfast on a Sunday morning. 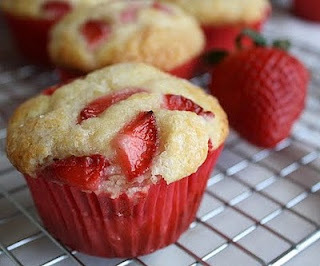 Simply mix everything together and then gently fold in the sliced strawberries. The mixture is VERY thick. Gently place in to your muffin / cupcake liners or into a lined round cake tin and bake in a moderate/slow oven until just lightly golden on the top. Mmmmm, so good and so easy!